When you take your children to play places like Jumpin’ Jamboree, we know that safety is always on your mind. At our Doral location, we guarantee that your child is safe! Safety is always our first priority at Jumpin’ Jamboree. In order to provide a fun-filled and safe environment for your kids, we have created a comprehensive safety plan that includes a monitored exit safety procedure. We know that safety is important to every parent that brings their kids into our indoor playground, so we set different safety procedures that our staff always follows. 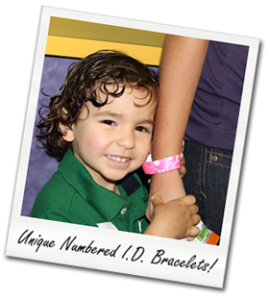 Upon entry, all kids and guests are provided with a unique identification number, which is required to be matched to a corresponding adult upon exiting our facility. We have a controlled exit door monitored by our staff at all times. Our facility is video monitored. Members of our staff are always supervising play areas. We have properly trained staff throughout the facility. We use certified inflatables with safety mats at all entrances and exits. We have a giant sectioned off toddler soft play area. Soft play and inflatables exclusively for toddler usage. These safety procedures help keep your children safe while they play at our indoor play place. We do everything in our power to ensure that each child is safe when they are enjoying our inflatable playground. Even during birthday parties, we have staff there to help you watch all of the children, so you can relax a bit. Jumpin’ Jamboree is committed to sanitizing all of our inflatable surfaces and toddler soft play area by utilizing the latest in environmentally safe and OSHA approved cleaning solutions. The solution used is professionally applied and is intended to reduce exposure to germs and cross-contamination for all who visit and play at Jumpin’ Jamboree, making our environment cleaner than public playgrounds, daycare centers, and even schools. As a family-owned business, we know that the safety of your child is important, so we make it our priority. If you have any questions about Jumpin’ Jamboree’s safety, please feel free to contact us!